Steve Cishek was drafted by the Marlins in the 5th round of the 2007 draft. Since the draft, Cishek has had a good deal of success, posting stellar numbers over the past four years, finishing each of his big league seasons with an ERA below three. Cishek made his major league debut in 2010, and began serving as the on and off closer for the Marlins in 2012, before becoming the full time closer for the 2013 season. Despite a rough start, Cishek finished 2013 with a 2.33 ERA over 69.2 innings pitched, striking out 74 while tallying up 34 saves. With his consistency, Cishek should continue to serve as an effective closer for the Marlins for years to come. Regardless of his unconventional sidearm delivery, he has deceptive stuff that should lead him to more of the same success down the road. My Dad would always tell me that when I was a kid I always wanted him, or anyone capable of throwing a round object, to pitch to me. That’s all I would say — “Pitch to me.” So I have loved baseball as long as I can remember. I also really enjoyed watching the Red Sox, especially when Mo Vaughn was hitting. And then when Nomar became popular he was my favorite to watch. My favorite player growing up was definitely Nomar Garciaparra. He was the best on the team, and it was like a rivalry with Yankees fans and Jeter. So I had to cheer extra hard when Nomar was playing the Yanks. 3.) You were drafted by the Marlins in the 5th round of the 2007 draft. What was that process like for you? Where were you when you first found out? Initial thoughts? The process was exciting/nerve wracking. I filled out a lot of player profiles for almost every team; it was like extra homework. But when it came to draft day, I was pretty nervous. When my name popped up on the draft board we all freaked out. We had dial-up internet then, so the draft board was loading sooo slow. I was losing my mind. But my name popped up, and I got a phone call soon after from the Marlins’ scout, and I realized I had a new and unique journey that was about to unfold. 4.) Why did you decide to pitch with a sidearm delivery versus a traditional delivery? When did you first begin using it? I didn’t realize I threw from my arm slot until I got to college. Even today I feel like I throw over hand. But back in high school and college I was a low 3/4 slot, and I think when I got to pro ball and the big leagues my arm slot got lower because I was throwing a lot more often. 5.) You took part in the 2013 World Baseball Classic. What was the overall experience like? What did you take away from it? The WBC was the best baseball experience I have ever had. It was so humbling to look around the locker room and see the caliber of players in there. I never imagined I would be wearing the same jersey as any of these guys, let alone be wearing a USA jersey. And the games — I hadn’t been that nervous in a game probably ever. There was nothing like playing against another country while representing your country (from a sporting standpoint). I got to pitch in high pressure situations, so I learned a lot about taking a step back and relaxing/calming my nerves. So I felt that it prepared me for high pressure situations during the season. 6.) As the Marlins’ closer, how do you prepare yourself mentally to come into the game in the ninth inning, knowing it’s your job to hold down the lead for the team win? I prepare to close a game the same way I would prepare for any other situation. I go through my routine and after the 6th inning I like to stand for the rest of the game so I don’t get lazy. I get pretty fired up when my name is called to go in but what makes my job more stress free than the other person is that I am playing for Him, and not to please people. I pull a card that reads Colossians 3:23 [“Work willingly at whatever you do, as though you were working for the Lord rather than for people.”] out of my back pocket to remember that before every outing. And no matter what, if I do well or poorly, I know God still loves me and I am satisfied with that. 7.) Despite a rough start to the year, you pulled things together to have the best statistical season of your career thus far. What changed that enabled you to have success in the remainder of the season? Baseball is so mental, and I went through a period where I was playing scared. We were not winning many games and when I went in it was only when we were winning. So I put a lot of pressure on myself to get the job done and that resulted in me playing scared. My coaches worked with me a lot, but ultimately it took two Christian brothers, Juan Pierre and Chris Coghlan, to come confront me and basically tell me I need to let it go and leave it in God’s hands. I asked God for forgiveness for playing to please man and I accepted His will. I felt like the team showed flashes of being a great team. From late May to early July, we had the 2nd best record in the NL. We have great young talent that is so close to being ready for the big leagues; I can’t wait to see what we are capable of in the future. Our goals are obviously to win a championship, but I feel it is much more important to have smaller goals that lead up to that big goal. My goal is just to get better everyday and to try and be a light as much as possible on and off the field. My wife and I are really into a lot of TV shows. We enjoy suspenseful shows and ’24’ is on that list. When we have down time, especially after a long day, we may come home and watch an episode, just to relax and enjoy each other. My favorite food is definitely chicken parm. Anytime I go to a new restaurant, I have to try it if they have it on the menu. I would tell them to leave the video games alone until night time and enjoy playing outside. When I was growing up we played every sport and we competed every day in our neighborhood. I am so thankful for the neighborhood we grew up in because we were always playing outside. You name the sport, we played it. So make sure you stay active and play other sports too. You don’t want to get burnt out playing baseball all the time. And when you are old enough to concentrate on one sport: (1) Play for His glory (2) Work as hard as you can at it (Col. 3:23), because someone else is probably working harder than you. Big thanks to Steve Cishek for taking the time to answer my questions. 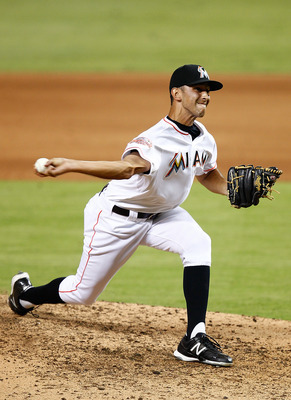 This entry was posted in Dailies and tagged 2007, 2010, 2013, 2014, Baseball, Christian Athlete, Closer, ERA, God, Interview, Marlins, Miami, Miami Marlins, MLB, Relief, Saves, Sidearm, Steve Cishek, Twitter, WBC, World Baseball Classic by Matt Huddleston. Bookmark the permalink.